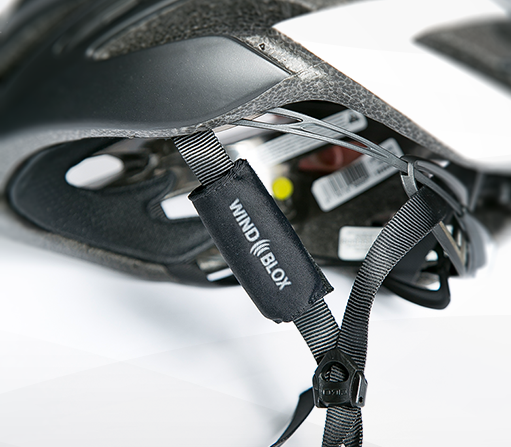 The new Wind-Blox Pro has a low-profile and patented rim-to-clip design that sets Wind-Blox Pro apart--it stops over 80% of wind noise, allows cyclists to keep the sounds they want, is very simple to attach and maintain, is technical looking, and has a reflective label for greater nighttime visiblity. The Pro works well for adjustable-clip helmets, is 10 cm long, 2 cm wide (in use) and weighs 0.4 oz. The new Wind-Blox ProXL is particularly designed for riders with hearing aids or more prominent ears. Similar to the Pro the patented rim-to-clip design that sets Wind-Blox Pro apart--it stops over 80% of wind noise, allows cyclists to keep the sounds they want, is very simple to attach and maintain, is technical looking, and has a reflective label for greater nighttime visiblity. The Pro works well for adjustable-clip helmets, is 11 cm long, 3 cm wide (in use) and weighs 0.5 oz. The new Wind-Blox Specialized Pro has a low-profile and patented rim-to-clip design made especially for Specialized and other fixed-clip helmets. Just like the regular Pro, it stops over 80% of wind noise, allows cyclists to keep the sounds they want, is very simple to attach and maintain, is technical looking, and has a reflective label for greater nighttime visiblity. The Specialized Pro works well for adjustable-clip helmets, is 7cm long, 2 cm wide (in use) and weighs 0.3 oz. Our updated Wind-Blox Classic has grip-strips to allow cyclists to enjoy almost 80% wind noise blockage without the need to adjust. Like the new Pro model, the Classic allows riders to keep the sounds they want, is simple to attach and maintain, technical looking and has a reflective label for greater nighttime visibility. The Classic works well for fixed-clip helmets, is 6 cm long, 3 cm wide (in use) and weighs 0.4 oz.